Members: Complimentary with 90 days from approval date (MSPS member benefit, please sign into the MSPS website for member pricing!). Non-Members: $100 with 90 days from approval date. Members and guests/non-members post a job opening or classified by completing the form and payment info in the e-store (the link will take you to the e-store). NOTE: All posts are subject to review before they are posted. Allow 1 business day for approval. If you post a job at 9:00am and you do not have approval by 9:00am the following business day, please email the Communications Department. Job Postings may take up to 24 hours after submission to appear. To view your job posting/or to submit a job posting, you must be signed into the MSPS website. If you are not a member you may create a guest account/non-member account. Once your job posting purchase is complete you will be sent an email invoice that should be used to populate your job posting. If you have a question about your job posting or the Job Bank, email the Communications Department. Job ads and classifieds are posted for 90 days from the time they go live and are available for viewing to the public. To view all job postings choose "submit" with no search criteria selected. We have job posting from Minnesota, Iowa, Washington and other states! Some titles include "Field Technician, "Land Surveying Drafting Technician," and "Survey Crew Chief." View job posting field options to complete the MSPS job posting. At the end of the form we ask for your contact information. This contact information is for administrative use only, it will not be included with the details of this opportunity or be otherwise publicly displayed in any way. Additional Categories Hold CTRL (or open-apple on a MAC) while clicking to select multiple categories. How to Apply / Contact Please submit any additional information you will need from a candidate. Your Contact Information* This contact information is for administrative use only, it will not be included with the details of this opportunity or be otherwise publicly displayed in any way. 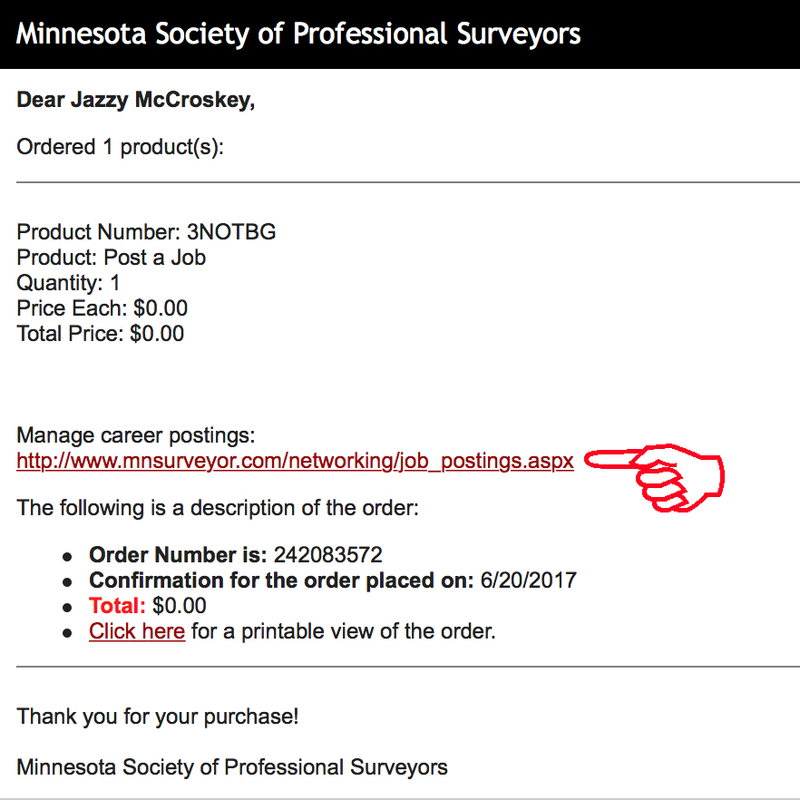 Look for this confirmation email to populate your Job Posting details!